Let us return for a moment to the election night in 2008. As I sat in our farmhouse in Pennsylvania, watching Barack Obama's victory speech, I turned my head aside so my wife would not see the tears in my eyes. I suspect that millions cried. It was a great day for America. We had great hopes for Barack Obama — perhaps our dreams were unrealistic — he is only human. But it is appropriate, it is right, in a period honoring Martin Luther King, to recall the hopes and dreams of that evening. We had a dream — that the new President would understand the intergenerational injustice of human–made climate change — that he would recognize our duty to be caretakers of creation, of the land, of the life on our planet — and that he would give these matters the priority that our young people deserve. We had a dream — that the President would understand the commonality of solutions for energy security, national security and climate stability — and that he would exercise hands–on leadership, taking the matter to the public, avoiding backroom crippling deals with special interests. We had a dream — that the President would stand as firm as Abraham Lincoln when he faced the great moral issue of slavery — and, like Franklin Roosevelt or Winston Churchill, he would speak with the public, enlisting their support and reassuring them. Perhaps our dreams were unrealistic. It is not easy to find an Abraham Lincoln or a Winston Churchill. But we will not give up. There can be no law or regulation that stops us from acting on our dreams. Figure 1: Total conventional fossil fuel emissions (purple) and 50% of unconventional resources (blue). The blue bar is 50% of known UFF resources. Supporters of UFF development argue that only 15% of the tar sands resource is economically extractable, thus we may exaggerate their threat. On the contrary, Figure 1 is a conservative estimate of potential emissions from tar sands because: the economically extractable amount grows with technology development and oil price; the total tar sands resource is larger than the known resource, possibly much larger; extraction of tar sands oil uses conventional oil and gas, which will show up as additions to the purple bars in Figure 1; development of tar sands will destroy overlying forest and prairie ecology, emitting biospheric CO2 to the atmosphere. We show in “The Case for Young People” that it is probably feasible to avoid dangerous climate tipping points, but only if conventional fossil fuel emissions are phased down rapidly and UFFs are left in the ground. If governments allow infrastructure for UFFs to be developed, either they don't “get it” or they simply don’t care about the future of young people. Preserving creation for future generations is a moral issue as monumental as ending slavery in the 19th century or fighting Nazism in the 20th century. Citizen's Arrest on Hillary Clinton and Barack Obama? George Bush confessed our addiction to oil. Taking tar sands oil amounts to borrowing a dirty needle from a neighbor addict. Fortunately, Congress adopted and Bush approved the Energy Independence and Security Act 2007, which was intended to prevent US agencies from buying alternative fuels that generate more pollution in their life cycle than conventional fuel from customary petroleum sources. Tar sands oil not only exceeds conventional petroleum, but the energy used in mining, processing, and transporting tar sands oil makes it slightly worse — in terms of CO2 produced per unit energy — than coal. Who would drive a car powered by coal!? This raises a question: if the Keystone XL pipeline is approved, can we make a citizen's arrest on Hillary Clinton and Barack Obama for violating the Energy Independence and Security Act? If they were put in the back of a hot paddy wagon in DC and held for at least several hours with their hands tied behind their backs, maybe they would have a chance to think over this matter more clearly. Let's address a common criticism: “It does no good to stop the Keystone XL pipeline, because other pipelines will be built.” Indeed, pipeline opposition and other stopgap actions (closing a coal–fired power plant, etc.) have little ultimate effect unless we put in place the real solution. a. 'Law of gravity': as long as fossil fuels are cheapest, someone will burn them. b. Fossil fuels are cheapest because: direct/indirect subsidies; human health costs not paid by fossil fuel companies; and climate disruption costs not paid by fossil fuel companies. c. Only workable solution: rising across–the–board flat fee on carbon, collected from fossil companies at point where fossil fuel enters domestic market (domestic mine or port of entry). d. Larson rate — $10/ton of CO2/year — at year 10 yields 30% reduction in US emissions. e. 30% of US emissions is ~ 13 Keystone XL pipelines!!! By year 10 the Larson fee is equivalent to $1/gallon of gasoline. The public will not allow this to happen unless 100% of the collected fee is distributed to the public, which could be done electronically to bank accounts or debit cards. By year 10 the fee collected from fossil fuel companies would be over $500 billion per year, providing $2–3,000 per legal adult resident of the country. How could this be achieved, given our well–oiled coal–fired Congress? Not easily. Obama had the chance when he was elected. He would have needed to explain to the public that national security, energy security and climate security all yield the same requirement: an honest price on carbon emissions that provides market–based incentives for moving to clean energies. Obama lost his chance for a spot on Mount Rushmore by not addressing the moral issue of the century. He would have needed Teddy Roosevelt's drive and Franklin Roosevelt's ability to speak to the public. A second chance if re–elected? It would be much harder, even if characters like Inhofe are smoked out by then. And it cannot be done with a sleight–of–hand approach, pretending there will be little impact on fossil fuel prices as in the proposed cap–and trade, or with government picking winners as in the would–be “green jobs” program. The energy/climate matter will be addressed eventually. But will it be in time and which country will lead? There is an incentive to be the first to put an honest price on carbon: future global technologic and economic leadership. Europe squandered its resources on government specified inefficient technologies. If the United States continues on its current path, and if China seizes the opportunity to be the leader by putting an honest price on carbon, it will probably mean second–rate economic status for the United States for most of this century. If President Obama chooses the dirty needle (approves the Keystone XL pipeline) it is game over (for the earth's climate) because it will confirm that Obama was just greenwashing, like the other well–oiled coal–fired politicians with no real intention of solving the addiction (of fossil fuels). Canada is going to sell its dope (dirty tar sands oil), if it can find a buyer. So if the United States is buying the dirtiest stuff, it also surely will be going after oil in the deepest ocean, the Arctic, and shale deposits; and harvesting coal via mountaintop removal and long–wall mining. Obama will have decided he is a hopeless addict. Have no doubt — if the Keystone XL tar sands pipeline is approved, we will be back, and our numbers will grow. For the sake of our children and grandchildren, we must find a leader who is worthy of our dreams. 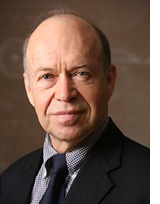 Dr. James E. Hansen is director of NASA Goddard Institute for Space Studies in New York City and adjunct professor in the Department of Earth and Environmental Sciences at Columbia University. Hansen is best known for his research in the field of climatology. In 1988, Hansen’s testimony before the US Senate was featured on the front page of the New York Times and helped raise broad awareness of global warming. Hansen’s work has inspired scientists and activists around the world to fight for climate change solutions. 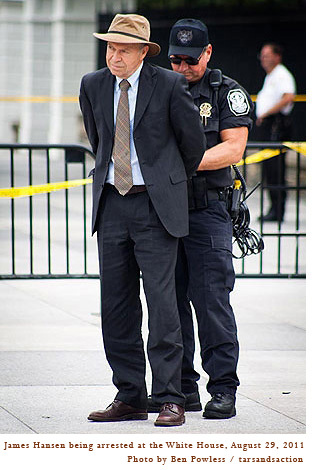 In recent years, Hansen has become an activist for action to mitigate the effects of climate change, which on several occasions has led to his arrest. In 2009 his book, Storms of My Grandchildren: The Truth About the Coming Climate Catastrophe and Our Last Chance to Save Humanity was published.